One of Starbucks most popular seasonal drinks is the pumpkin spice latte. The drink is described as being made with “pumpkin pie spices” on the company’s website, but the main flavoring component is not a pinch of spice – it’s a pump of Pumpkin Spice Sauce. This thick syrup has a similar consistency to the caramel sauce that tops off their caramel drinks, tastes a lot like pumpkin pie and has a brownish orange color to it. I’m not entirely convinced that simply stirring some pumpkin puree into a cup of coffee would really give your drink a similar effect, but there are two store-bought options that can make sure your cravings for Pumpkin Spiced drinks are filled – without breaking the budget with too many trips to Starbucks. Torani syrup makes a Pumpkin Pie Sauce that might be the brand that Starbucks uses, since most of their syrups come from that company. 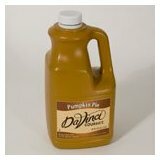 DaVinci Gourmet also makes a Pumpkin Pie Spice sauce that offers the same, thick consistency. In both cases, the bottles sold are big. Fortunately, there are at least two months left of pumpkin spice season, so that leaves plenty of time to get through them. And, if you find you have some leftover when the weather starts to warm up, you can always try your hand at blending a Pumpkin Spice Frappuccino.